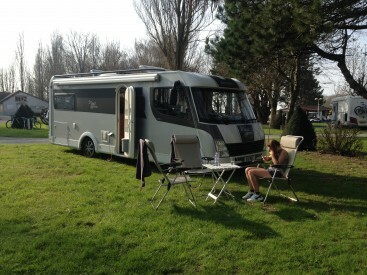 Leaving Bristol on a Thursday, just after midday, the Rawlins family “arrived at base — near Edinburgh, around 7pm — a lovely Caravan Club Site that we can thoroughly recommend,” said Beth, who describes her Scottish motorhome holiday in more detail below. The next day we woke up to a dry mild day, and headed into Edinburgh, via a taxi. We visited the impressive castle, spending hours interested in learning about Scottish history. On Saturday, we were all early, on the road to St Andrews to continue our flexible Scottish motorhome holiday. My husband and my son had a round of golf, my daughter had a pyjama morning. I headed off for a refreshing run along the beach that the golf course overlooks. For any of you film buffs this beach is also the beach where Chariots of Fire was filmed. From St Andrews we travelled up to Pitlochry and took a look at the salmon ladder. The scenery along the way was beautiful. We really wanted to use the trip to cram a lot of Scottish sights in so continued North up to Aviemore. The way to Aviemore was lined with vast forests, which were spectacular to see in their autumn colours. Continuing on, we made it to Inverness and stayed overnight. Much to the delight of our teenage daughter we arrived in time to watch ‘Strictly Come Dancing’ and ‘X Factor’. By Sunday we were in Loch Ness, passing the famous battlefield of Culloden on the way, famous for a battle in the 1700’s. Personally, I was astounded by the size of the Loch. I hadn’t anticipated it would be so vast. The Loch Ness Visitor centre was well worth a visit and we were allowed to park in the coach spaces. We learned that Loch Ness at it’s deepest point is 230m and that that there’s enough water in Loch Ness to cover the world’s population three times over. Fascinating. With no sign of the monster, we left Loch Ness and travelled south through Fort Augustus, but didn’t stop there — had we had more time it looked well worth a visit. We continued towards Fort William passing snow capped mountains on the way, arriving for lunch in Fort William. After Fort William we drove to Glencoe. Here, and in the surrounding area heading in the direction of Glasgow we found our favourite mountain scenery — the colours and mountains and waterfalls on the mountains were spectacular. In the motorhome our holiday could be really very flexible depending on weather and our mood and after a discussion with the children we agreed to head south to The Lake District. We had always planned a two country holiday taking in Blackpool Pleasure beach and Alton Towers on the way home so we decided while the weather was bad we would get a big chunk of the journey done and arrive in Blackpool the following day. The scenery through Stirling was really quite something and passing Loch Lomond was also very picturesque. We arrived at a site in the Lake District around 6.30pm, a Caravan Club site near to Grange Upon Sands, called Meathop Fell, which was a beautiful site with very friendly wardens. We had a very exciting Monday and left the campsite to head to Blackpool Pleasure Beach where the kids had a lot of fun. Just a five minute drive away from the main attractions. GoApe in Cannock Chase, near Stratford, was another fun day out that dictated the route of our trip. By the end of the week the weather had changed for the worst so we decided to have a lazy morning. It felt very cosy in the motorhome all snug with the sound of the wind and rain outside, where it couldn’t get to us. On Friday, it was time to go home. Originally, we had planned to stay away until Saturday. But our daughter had a big party to get to on the evening. Which for a teenager would be cardinal sin to miss! We travelled back during the morning and the unpacking and washing commenced. For more information on our Scotland tours and how we could help you plan the perfect holiday for your family. Call us on: 0117 9372644, or simply email: info@motorhometravelagency.com. Dream it, book it, discover it…with the Motorhome Travel Agency.